This is the seventh in a long series of posts that will teach and explain The 6 Perspectives of Leadership™. The director raised his baton, did a quick rising action with both hands and lowered the baton to show the down beat and start of the music. Only about one-third of the players, mostly middle-schoolers and ninth-graders, played their opening notes. The director immediately motioned a cutoff to stop the music. “When I bring my hands up like this…” he showed his hands in the opening position, baton up and his other hand parallel, “all of you should get into ready-position. Take your breaths, get your fingers ready, eyes on me. That way, we don’t have to waste our time with extra beats, nor will I have to call out to get your attention. Besides, this is the expectation when you get into high school and college.” He lowered his hands. “Let’s try it again.” He raised his hands. All students got into ready position. The director gave a single up beat then on the down beat the whole band played. This was the Central Oregon Concert Band Camp, led by Director Ben Lawson. It was a full week long, six hours a day. Mr. Lawson, as the students call him, set his band camp attendees up for success. He is transitioning them into high school with knowledge and skills so that they can experience greater success and become future leaders in their own right. This entire experience was about enabling students for success. The director and assistant directors gave them knowledge, tools, and training. This was a clinic in great leadership. Specifically – The Third Perspective of Leadership, Leading from BENEATH by ENABLING. For the sake of clarity, let’s do a short review. The first perspective of leadership is Leading from the Front with Vision. The second perspective of Leadership is Leading from Above with Strategy. After the Vision and Strategy are in place, it then becomes time to ENABLE your people to bring the vision and strategy to life. We saw these three behaviors in action with the story of Ben Lawson, his staff, and the Central Oregon Concert Band Camp. What tools do each of your employees need to be successful? A well-known fast food chain provided more ingredients to local franchises allowing them to get creative and meet the needs of their local customers. They soon found dramatic sales increases in the double-digits to those locations with access to more ingredients. Are the tools of your trade readily available if something breaks? Is procurement of new tools a fast and seamless process? Are you the only person who can provide the tools or do you have back-ups in place? What specific training and knowledge do your people need to be successful? Think about how you set up their first few days and weeks. Do you expect them to “sink or swim?” Or do you set them up with a skilled and knowledgeable trainer? Do you maintain a training-checklist? Have you given your trainers the opportunity to learn how to effectively train others? Even the trainer needs training? What are the individual needs of each of your employees? Are the physical accommodations that are necessary? **We may want everyone to change to meet our preferred processes and systems, but that’s not how it works. If you go that route, you will burn through your people because they WILL leave. You lead from Beneath by Enabling when you ensure that the organization has processes, systems, tools, and people, in place so that Enabling others can happen at all. You lead from Beneath by Enabling when you empower and develop your front-line leaders to have access to the tools, systems, knowledge, and support that allows them to Enable the employees under their purview. This was written with you in mind. Figure out if you, yourself, are truly enabled provide tools and training to your people. If you aren’t, advocate for yourself. Go to your supervisor or manager and ask for what you need to truly be able to enable your people for success. I checked in with Mr. Lawson after the performance on the fifth day of the Central Oregon Concert Band Camp. “They performed their best and had nice musical moments,” he said. This was a success!! Think for a moment about what it is a band director accomplishes. On the day of the performance, the director doesn’t make a sound. They may move their arms around and wave that baton with passion. But every sound, every note, every harmony and articulation comes from the players who are being led by the director; but the director makes no sound. Being a band director might be the ultimate test in enabling others for success. 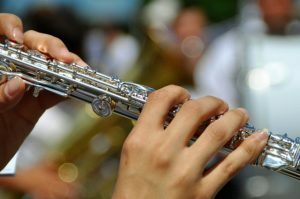 In so many industries, weak leaders have the luxury of saying, “I’ll just do it myself.” But you can’t do that as a band director, or choir director, or orchestra conductor for that matter. If you are a leader, and your people are struggling to perform up to expectations, stop and take stock; have you done what you need to ENABLE them for success? Have you done what you need to do so that you could be like a director, not make a sound yourself, yet have happy and productive people driving your workforce? Meet your people where they are and then guide them to expected performance. If you are a leader – this is your responsibility. Your people are responsible for their performance, but you are responsible for enabling them to perform. This was Part 7 in a multi-part series that will teach and explain The 6 Perspectives of Accountable Leadership™. Share this post on LinkedIn and tag your colleagues. Share it with your network. If you found this valuable others may as well.